The Internet of Things in healthcare: Why start integrating now? The Internet of Things in healthcare: Why start implementing now? Healthcare is one of the biggest and fast developing industries in the world, that directly impact life quality. Facing the growing dependency on innovativeness and the necessity of ensuring great patient treatment, IoT is bringing effective tools and technologies in the industry resulting in improved diagnosis, patient care, and disease prevention. With an increasing use of IoT medical devices, healthcare organizations can optimize different processes and reduce their expenses. In 2017 there was Aruba Networks research focusing on IoT use cases and representing the current state of the Internet of Things in healthcare. It showed that now healthcare organizations primarily use IoT applications for patient monitoring and maintenance (73%) and remote operation and control (50%). Also, let’s look at some interesting facts and projections related to IoT technology in the industry. 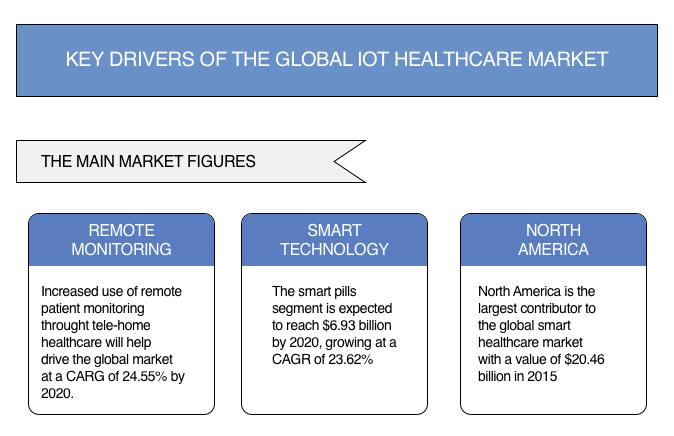 According to Technavio survey, the global IoT healthcare market is expected to reach $ 169.30 billion by 2020 with the major part of IoT medical devices for remote monitoring. For today, 60% of healthcare organizations have already integrated IoT medical applications into their work. According to projections, 87% of healthcare organizations will use IoT technology in 2019. By 2019, 60% of IoT medical applications will collect real-time location data and clinical IoT device data and embed cognitive capabilities to define patterns, thereby freeing up 30% of clinicians’ time. By 2019, there will be a 50% rise in the adoption of robots to ensure a simple and fast delivery of medications, supplies, and other things throughout hospitals (IDC) and exclude human participation from some operations. By the end of 2018, players will have saved $1 billion through the integration of robotic process acceleration (RPA) tools, skill sets, and process re-engineering. By 2020, there will be an increasing use of remote patient monitoring through home healthcare, that will help drive the global market at a CAGR (Compound Annual Growth Rate) at 24.55%. Surely, the figures impress. The Internet of Things is going to bring revolution in healthcare, and in this post, we will show you how and answer the following questions: Why should start use IoT medical applications? What are the benefits of connected healthcare? What problems can IoT medical devices solve? So, let’s start! The Internet of Things in healthcare involves the collection and integration of real-time data with EHR or electronic healthcare records. There are multiple sources to capture information such as medical and non-medical assets, people, IoT mobile applications, medical equipment, sensors, and other IoT medical devices. RTHS, or Real-time Health Systems, are promising to take the center stage for IoT in healthcare, allowing to receive the most actual data, enhance diagnosis, and the whole treatment. Moreover, many organizations start using Big Data analytics solutions for predictive analytics as part of healthcare systems improvement programs. IoT medical devices are starting to weave into the healthcare industry on both the doctor and patient sides. Thermometers, glucose monitors, ultrasounds, electrocardiograms and other devices are becoming interconnected. This enables patients to track their health by checking different parameters. Having a connected and secure database, medical professionals and physicians get immediate access to medical records and other valuable healthcare data. IoT allows gathering data from various devices, while Big Data processing tools provide effective and time preserving solutions by analyzing medical history, reports, medical records, and health patterns. With IoT connected patient, the IoT healthcare system can automatically remind patients about taking medication, health check-ups, appointments with mobile applications integrated into the platform. Connected healthcare results in more advanced data and improved patient care. Remote monitoring systems enable both patients and healthcare professionals to track physician’s health at home without the ability to go to the doctor’s office. IoT medical devices and applications can be used by healthcare providers to monitor patient individual’s’ health status while they are at home. Such solutions also send doctors automatic alerts about health deteriorations and call an ambulance is required. Hence, the Internet of Things will transform patient home treatment. Healthcare organizations can also integrate a patient and equipment monitoring system that would incorporate RFID tags embedded in electronic patient records, wristbands, and a personal digital assistant. Beacons and motion sensors as the parts of the solution will allow healthcare organizations to monitor medical equipment, employees, and patients in real-time, estimating work efficiency, patient health status, and manage equipment. Such IoT system will also enable healthcare professionals to get access to patient information at any time by scanning their unique ID numbers. Today more and more healthcare organizations are starting integrating smart beds, that can sense the patient presence and automatically adjust themselves to the correct place so that nurses don’t have to intervene and patients feel comfortable. Unfortunately, some patients often forget about taking their medications. Or they don’t take them in appropriate doses or at the proper time. Smart medication dispensers ensure the ability to automatically inform doctors when patients don’t take their pills. It works thanks to an embedded cellular connection that enables sending notifications when a patient’s needs to take medicines. What’s more, such IoT solution can alert healthcare providers about potentially dangerous patient behavior. For now, 400 million of people in the world are suffering from diabetes, one of the most widespread diseases that requires careful patient behavior and accurate treatment. IoT can help there too: imagine a smart device allowing to measure a blood sugar level and other parameters and send doctors automatic alerts if something goes wrong. Hence, IoT medical applications provide many benefits such as improved patient treatment, remote health status monitoring, intelligent analytics of healthcare data analytics and predictive analysis. 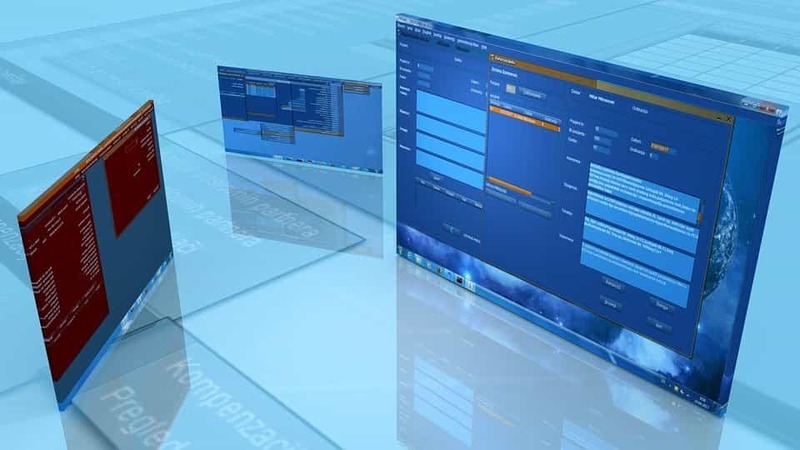 Speaking of custom mobile and web app development for the healthcare industry, we can also mention the integration of CRM software to solve various industry operational challenges. Learn more from our post “CRM in healthcare organizations: key problems and their solutions”.